Moonparticle is the new project of the London based Bulgarian guitar maestro Niko Tsonev. After two solo albums he became kind of famous by joining the band of Steven Wilson and later on Lifesigns. After seeing a brilliant Steven Wilson DVD I was hooked by this amazing guitar player. After that I did see him performing live with Lifesigns a couple of times. Two times I stood front row at our Dutch Prog temple de Boerderij at a Lifesigns gig and I met him again at the prestigious open air festival Night Of The Prog in Germany. 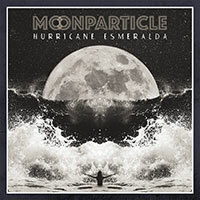 The first Moonparticle album came about through a PledgeMusic campaign and has the title “Hurricane Esmeralda”. On the album you can find some big names like Adam Holzman, Craig Blundell and Theo Travis, all fellow musicians of one of the previous mentioned bands. But he also collaborated with singer Grog Lisee. Together they wrote three of the seven tracks of this fine album. The album opens with the title track of the album called “Hurricane Esmeralda”. It is an up-tempo rock piece with some Pop influences. As reviewer I am surprised but In the last part we can enjoy a great synth/guitar duel. Adam Holzman plays this part in a way that reminds me of the freaky and high speed stuff of Mahavishnu Orchestra’s keyboardist Jan Hammer. This is followed by the two short tracks “Helium I” and “Helium II”. In “Helium I” you will recognize Niko’s own style of guitar playing. A style supported by his fantastic technique. “Helium II” is a beautiful track with acoustic guitars, nice orchestrations and marvelous flute playing by Theo Travis. Then it is time for the second Tsonev / Grog Lisee composition called “Winter Mountain”. Those three compositions are bringing diversity to the album. At first you are thinking that these three tracks would be better suited for another album, but if you listen to them several times you will understand them better. You can find beautiful guitar parts in those pieces that includes some intriguing and strange atmospheres. In the up-tempo piece “White Light” you can find several atmospheres. It has a rock oriented opening but also a beautiful and delicate played guitar part with a Hammond Organ accompaniment. The next track “Michelangelo Don’t Stop” is one of my personal favorites. It has that lovely Canterbury atmosphere which will remind you of bands like Hatfield and the North. Theo Travis is of course the perfect companion for this. But you will also find amazing drumming by Craig Blundell and Dave Stewart influenced keyboard playing of Adam Holzman. All this combined with great guitar and bass playing of maestro Niko Tsonev. Wonderful track! “The Strenght Of a Thousand Year Rose” is in my opinion the best of the three Tsonev / Lisee compositions. You can find beautiful vocal melodies and a breathtaking guitar solo of Niko in this piece. The slow “Reverend Mum” has nice drum programming and delicate played guitar parts. It is a kind of rest point before the album comes to an end with another highlight, “Leon’s Experiment”. It has beautiful synth and flute melodies. Again great drumming by Blundell and Adam Holzman shows that he is a marvelous keyboard player. Together with the jazzy and intriguing guitar parts of Niko this piece shows the qualities of the quartet Holzman, Blundell, Travis and Tsonev. All of them technically skilled players. This album is of course a must buy for Niko Tsonev fans. Niko displays excellent skills and his marvelous technique on this fine album. It is a diverse album which only shows it’s real beauty after several listening sessions. For this album Niko Tsonev has surrounded himself with some of his fellow musicians of one of his previous bands (Steven Wilson). So quality is guaranteed. This album is recommended to the open minded music lover. Guitar players will love this inspirational album.